Curious as to what color your foal will be when crossing your chestnut, bay, or black mare to Why? The most common color matches are listed below. If you would like more information, following is an explanation to the genetic phenonenom that occurs when sorrels, bays, and blacks are bred to cremellos (color genetic information from Dr. Sponenberg's book 'Equine Color Genetics'). Foals from red, bay or black mares will be palomino, buckskin or smokey black when crossed with Why. He is heterozygous for the Red Factor test and for the Agouti test he is negative. This makes him a heterozygous, black based horse, a Smoky Cream. AQHA will still show him as a Perlino, a bay based horse as they don't have smoky cream as a recognized color yet. When bred to a heterozygous red mare the possibilities are approximately 50% palomino, 25% buckskin and 25% smoky black. When bred to a heterozygous bay mare the possibilities are approximately 65% buckskin, 22% smoky black and 13% palomino. When bred to a heterozygous black mare the possibilities are approximately 88% smoky black and 12% palomino. Why can never produce a red colored foal. Your foal will never be bay when breeding to Whitey's Bar. With many smoky creams, perlinos and some cremellos a possibility of creating a smoky black foal exists. Why will produce smoky blacks. Here is a link to a site that does genetics testing ( in case you want to have your mare tested) and also has a very COOL foal color predictor. Enter Smoky Cream for Why in the first box, in the next box enter heterozygous (Ee) for red for Why and of course whatever you know about your mares color. There is no grey color listed - grey is not a color it is a modifier, much like the dilute modifier that makes a Palomino or Buckskin. AS many of you know, horses come in only 3 basic colors; chestnut, bay and black. That's it. Any other color is just a variation to these 3 basic colors and are due to contributions of other coat color genes responsible for adding lighter or darker shades, certain patterns (i.e. dun), or even adding spots and white hair to the horse's coat color. Other genes responsible for the colors we love so much are cremello, dun, champagne, sooty, mealy, shade, tobiano, sabino, and overo just to name a few. SO WHAT IS A CREMELLO? A cremello is a chestnut lightened twice because of his 2 copies of the dilution gene "Cr+, Cr+". A perlino is a bay lightened twice due to his 2 copies of the dilution gene. And a smoky cream is a black lightened twice with 2 copies of the dilution gene. (Although this gene is technically called the 'cremello' gene, many people know of it as the dilution gene, so I'll refer to it as 'dilution' here forward.) All these horses are known as "double dilute" horses. 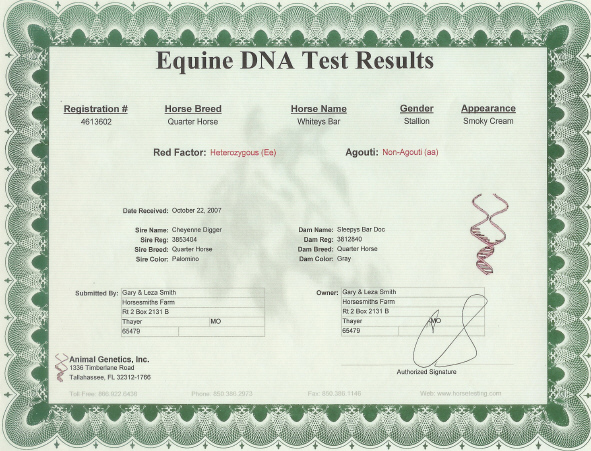 One copy of the dilution gene allows for the horses basic color of chestnut or bay to be lighted to a palomino or buckskin, respectively, and these horses have just one copy of the dilution gene "Cr+, -". When an animal posesses two copies, their basic color is lightened even further to either a cremello, a perlino, or a smoky cream. These horses were once thought to be albino horses, however, albinos don't exist in the horse world (refer to Dr. Ann Bowling, UC Davis)! Ever see a horse with red eyes??? Me neither. HOW DOES A CREMELLO CREATE A PALOMINO OR BUCKSKIN? When cremellos (or any of the double dilutes) are bred to a another horse they will ALWAYS contribute one copy of the dilution gene! Therefore, the chestnut based foal will be lightened to a palomino and the bay based foal lightened to a buckskin. But wait, it's not just that simple. Some bays can produce palominos for they may be heterozygous for the black/red factor. If that mare doesn't pass on that one black factor gene she may pass on a red factor (chestnut) gene and, therefore, produce a palomino. CAN A CREMELLO CREATE A LETHAL WHITE? Nope, not a chance. The color cremello is not the cause of lethal white foals, only the overo gene is! Cremello is a color and is not an overo expression! In order for a lethal white foal to be created both parents need to have an overo gene. For example, one of Why's parents needs to have a genotype positive for the overo lethal white gene for him to possibly pass on the overo gene. Even then, the mare he breeds with needs to contribute an overo gene as well, to create a lethal white foal . Whitey's Bar is Quarter bred and does not carry an overo lethal white gene. WILL A CREMELLO CREATE A FOAL THAT HAS BLUE EYES? Horses in Why's pedigree do not have blue eyes. Double diluted horses like Why do have blue eyes due to light skin and eye pigment. Any offspring from a cross with a solid mare to Why will have brown eyes unless the brood mare is from Paint/Pinto lines, has lines known for blue eyes, or the foal has excessive white face markings. It is thought that the three basic colors (chestnut, bay, black) are derived from two different loci. A locus (loci for plural) is an address or a location where two genes live on a chromosome pair. One gene is contributed by the sire and the other by the dam. Simply put, a loci with its' two genes represent a trait. Loci are located in the same place on the same chromosome for whatever trait it represents which is why genetic mapping is possible. For the basic coat colors there are two loci responsible for the 3 basic colors. Sound confusing? It's really not! The first locus to consider is the Extension locus. The Extension locus holds its' two genes and determines whether the horse will be chestnut or not. The other locus is called the Agouti locus and its' two genes are responsible for determining whether the horse will be a bay or black. It's real function is to determine whether the black expressed will be restricted to the points (bay) or if it will be spread uniformly over the entire horse (black). There can be many types of genes that exist in a particular trait's gene pool. An allele is just another name for those individual genes. An allele may be dominant, recessive, masked, or incompletely dominant. In coat color genetics, when dominant genes are present they are usually visible to us (except in the case of solid red horses) and are given precedence over recessive genes. Generally, they are responsible for the phenotype (the outward appearance) of the coat color trait considered. The incomplete dominance phenonenom is what you see every time you look at a palomino or buckskin. Since palomino/buckskin horses have only one copy of the dominant dilution gene their coats are lightened to gold. Two copies cause a doubled effect of lightening and creates a cream colored horse like our beloved smokey cream, Why! So with incomplete dominance, one dominant dilution gene (Cr+, - ) causes some lightening while two (Cr+,Cr+) causes even more! Easy enough, right? When the parents create their single celled gamates (the egg and the sperm), the cells with their full sets of chromosomes divide in half. Those two alleles living at that color locus split off singularly into separate gamates . In the case of Why, one dominant dilution gene is donated to 50% of the gamates (sperm), as well as, the other 50% of the gamates (sperm). He will ALWAYS give one dilution gene which is what's needed to make a palomino, buckskin or smokey black foal. TRYING TO GET THAT PALOMINO OR BUCKSKIN? Breeding a chestnut or bay to a palomino or buckskin stallion will only lend to a 50% chance of getting that dilute color. Why? Those stallions only have one copy of the dilute gene present on the dilute locus, the other gene is a recessive, nondiluting gene. When the sperm is created by those studs only half of the sperm will receive that dilute gene. The other half will have a recessive gene that doesn't create palominos or buckskins. These stallions will have a foal crop of theoretically 50% dilute foals. Luckily, with horse coat color, the alleles act more like on and off switches for each coat trait considered. If a dominant allele is present, it generally gets to determine whether the trait for that loci will exist or not. With the basic coat colors (chestnut, bay, black), the extension locus is the first locus mother nature considers. Its' function is to determine whether the horse will be chestnut or not. Its' genes act like an on/off switch. It can hold either a pair of "ee", "Ee", or "EE" genes with "e" being a recessive gene (red factor gene) and "E" being a dominant gene (black factor gene). ALL CHESTNUTS have a pair of recessive "ee" genes ONLY and these genes are located at the Extension locus. If the Extension locus has the "Ee" or "EE" pair, the Extension locus has, in a sense, switched off the chestnut color due to the dominant "E" present there. The recessive "e" which is found in the "Ee" situation has no say in the matter and the dominant "E" overrides its presence. Say good-bye to the solid chestnut color! So then what takes over? The dominant "E" says black is going to exist but in what form - as a bay (restricted to points) or black (spread over entire body)? To determine that, mother nature next looks at the Agouti gene to determine whether the foal will be bay or black. The Agouti gene pairs possible are "aa", "Aa", or "AA". The "a" is the recessive form resulting in black and "A" is dominant form resulting in bay. If the combination of "Aa" or "AA" are present, then the foal will be a bay. An "aa" pair at the Agouti locus will result in a solid black foal. As of mid April 03, Davis University in California offers the Agouti test to determine what resides at the Agouti locus. What can make color genetics so confusing is the Agouti genes are not reflected in the horses coat color when the horse is a solid red. When "ee" (solid red) exists at the Extension locus then an 'epistatic' gene situation occurs and the Agouti genes are not considered in the overall phenotype. This can lead to surprise foal colors when breeding your red mares to stallions with "Ee" or "EE" genotypes (therefore allowing the Agouti genes to be expressed). Breeding a solid red mare to a cremello will never result in a black foal. The resulting foal will always be a palomino. Always! ON rare occasions with many cremellos, if the mare is bay "Aa", a black foal could result called a smoky black which range from brown to black in color. The same exact phenonenom and odds happen when breeding a bay to any red based color stallion (chestnut, sorrel, palomino or cremello). How can this be? Both the stallion and the mare have to have a recessive "a" at the Agouti loci and both have to contribute it to the foal; "aa" = black. If your mare comes from a long line of bays the chances are fairly slim that she will ever produce a black. The same is true for the stallion, if the stallion shows a long line of non-blacks then his odds of being responsible for a black are very slim. If one of the parents have a dominant homozygous genotype "AA" at their Agouti locus then a black foal will never result no matter what color the other parent is, even if the other parent is a black horse! But don't just breed for color, Why's pedigree is loaded with champions and champion producers! Gray foals are the product of one or both parents being gray or soon to turn gray. Dreamer will not produce any grays unless bred to a gray mare. In this case, the outcome of the foal becoming gray should be 50%. These foals will have a dilute coat that will eventually turn gray! If you're interested in learning more about genetics, Dr. Sponenberg wrote "Equine Color Genetics" which is a fabulous book and can be found at www.conquistador.com/colgenetics.html. Also, Ann Bowling of UC Davis has web site that's very educational at www.vgl.ucdavis.edu. We would like to thank Nancy at www.lattefarms.com for sharing all this genetic information with us and allowing us to use it here. Latte Farms also stands a Cremello stallion from the same line as True Dreamin Dude. In addition to the double dilute factor, we are great fans of the dun factor. There is a link to a very informative article on dun factoring below.